This report summarises the major initiatives commenced or due to commence across the Victorian Government and major government agencies during the first two years of the health and wellbeing plan (until 2017). This document outlines key features of Australian settlement policies, programs and services available for humanitarian entrants and has recently been updated. This policy paper recommends that Australia end offshore processing, boat turnbacks and the mandatory detention of people seeking asylum. 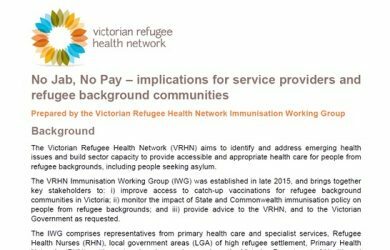 This briefing was prepared by the Victorian Refugee Health Network Immunisation Working Group. 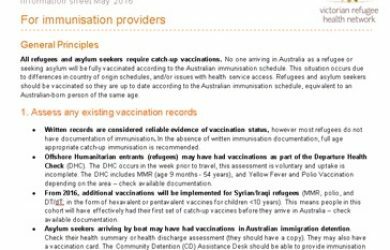 It documents a number of issues related to the Australian Childhood Immunisation Register (ACIR) that have direct impact on service providers and refugee-background communities.